War is a rather confusing thing. In combat, you're never 100% sure what your opponent is up to. You might not know exactly where they are. Orders from command can get garbled or might not reflect what is actually going on in combat and are thus ignored. Morale can mean a whole lot. So trying to reflect all of that on the gaming table can be rough. Well, that's what GobboTown Games is looking to do with AEON2, their new sci-fi miniatures rules set that is now available. 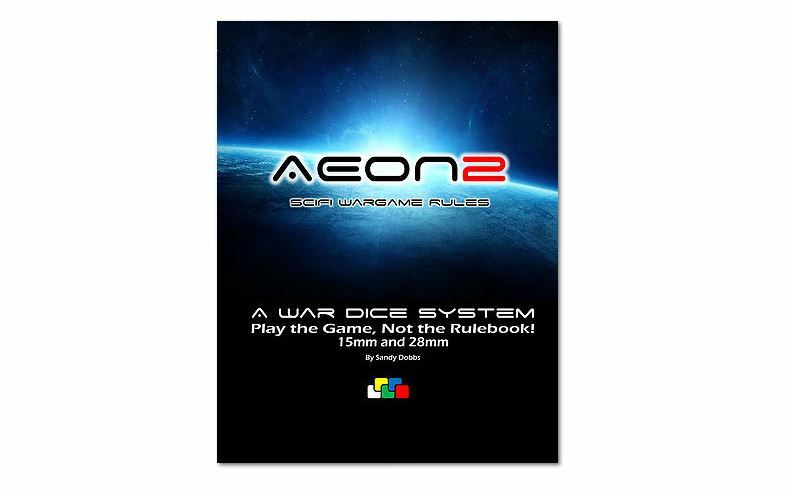 Now available at the Wargame Vault, AEON2. A science fiction ruleset for 15 and 28 mm. Throwing different dice, during gameplay, helps you tell the story. A fog of war philosophy keeps the player guessing at what his troops will exactly do and keep him guessing what the enemy player will do. Your men don't always carry out your commands to the letter. You will issue general orders, your commanders will interpret them to their abilities and issue orders to the units. A fast paced game where the advantage of play bounces from one side to the other every phase. The game even ends at a random point in the future, so giving the sense of urgency right to the end. Once you play the game a few times, most players don't need the book to play! The WarDice become the rules!